I suggest hanging out in astronomy forums. If you are in san diego, there is a monthly astronomy meetup out in east county, good place to check out a bunch of telescopes. Also check out the telescope store in Oceanside. Good places to put your hands on scopes before you drop a wad on an expensive toy. Oceanside Photo and Telescope is the name. Pick up a star chart while you're there, so you can orient yourself. You need to be really accurate with high power scopes because the field of view is tiny. There is usually a small parallel spotter scope to get you close to your target. I found sighting the telescope in really well during the day saves you lots of frustration trying to do it at night. Of course, I had no idea how to use one so I just picked a target in the distance and made sure the spotting scope and big scope were aligned. 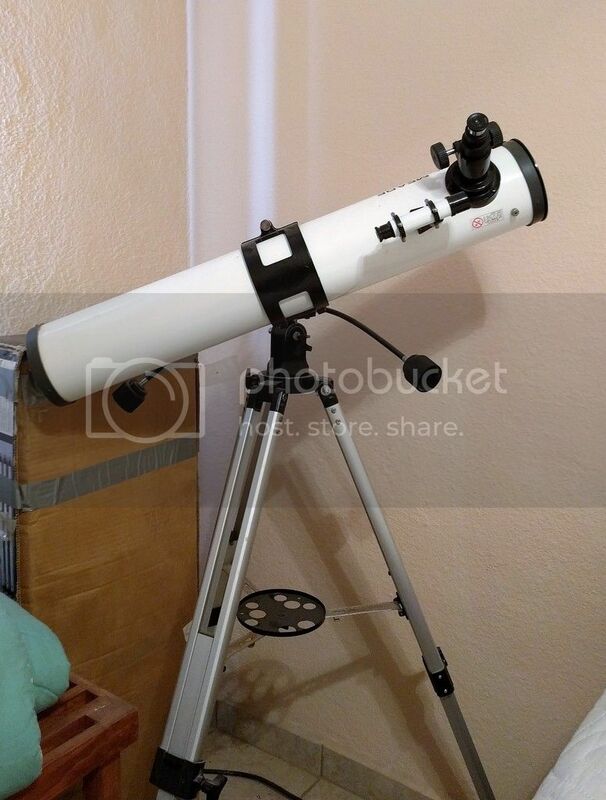 I have this telescope here in Asuncion. What I don't know about telescopes and astronomy would fill a lot of books so I don't know if this might be what will work for you, but you are certainly welcome to use it as you wish while visiting here if you don't bring one with you. It was given to me with instructions to give it to a school when I was done playing around with it but the local schools have not shown an interest in it so it just sits most of the time. That's a nice little reflecting scope. You can see the sighting scope (viewfinder) on the side, very important to have that aimed correctly. Only problem if you realize, is looking at vertical objects, the eyepiece will be too high to look into. So, have a step ladder available. You can probably re-adjust the scope mount/tripod a bit to make it better, but every movement takes you time to re-target the scope, especially at night. They make reflecting scopes with a bottom mount, called a Dosbsonian mount, after the inventor. It eliminates that problem but has it's own eccentricities. 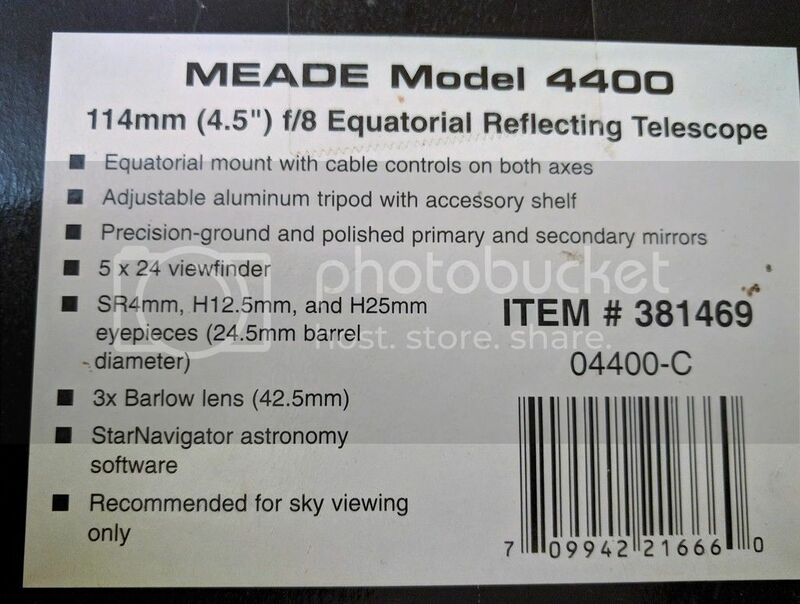 I believe the equatorial mount is referred to as a Newtonian mount IIRC. You gotta love the "For Sky Viewing Only" message. What, I'm gonna look in women's windows from ten miles away? Binoculars are very practical too!! Actually much easier and infinitely more portable. You don't need a telescope to spot UFOs. That is what mescal and tequila are for! You don't need a telescope for this one. The ISS makes regular passes, very visible even though it is about 250 miles up. Sign up for alerts, either text or email, and when it is coming over your area you will be advised ahead of time. And impress your friends, you can look real smart by pointing at the Western sky an hour after sunset and saying "Watch this!!" Don't get one that is too technical to use. We made that mistake and to this day I still don't know how the damn thing works. As an alternative to looking thru glass, there are space watching apps for your phone. 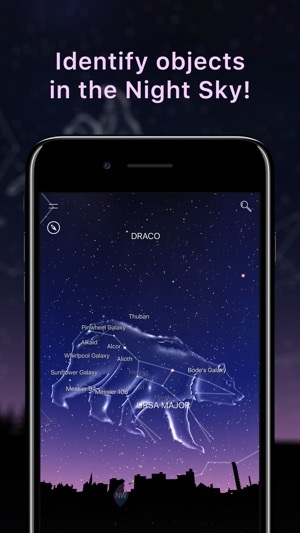 Point your phone to the sky, and it will show you names of stars, constellations, satellites, etc. That great bear swallowed a Big Dipper!